Here you see me, S.F. 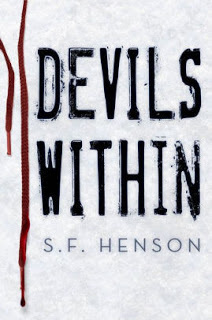 Henson, attorney and author of Devils Within, my debut YA novel that's out October 31. In my lap, sitting so that I can't reach my sweet caffeinated nectar, is Francie. She's a little over a year old. We think she's a Golden Retriever mix. There could be some German Shepherd in there, but honestly Francie is probably the result of a drunken night, so anything could be mixed in. (Just out of sight, and reach, is my favorite coffee cup). We needed an afternoon caffeine boost (and by "we" I totally mean me. Francie doesn't need any additional energy!). The weather was gorgeous and Francie had just rocked her daily training, so we headed to the back porch to relax. Usually it would be a mocha from my favorite local coffee shop, Angel's Island, but since it's closed on Sundays I'm drinking a Gevalia mocha latte from the two-in-one autodrip/k-cup coffee maker in my kitchen. Any treats for you or Francie on this occasion? Francie got a mix of Pet Botanics chicken flavored training treats and good old fashioned milk bones. An afternoon with my pup was treat enough for me. How were you and Francie united? My husband and I adopted her from Animal Services about a month ago. We'd actually gone to look at another dog and saw Francie curled up on a cot in the back of her pen. We couldn't resist her tufted ears and sweet nature. We thought she was a calm, chill older dog who needed love when everyone else was interested in the puppies. Turns out she was younger than we thought and she'd just been spayed. So not calm, drugged. Saturday morning she was a whole new animal! We couldn't be happier with our choice, though. How did your dog get her name? Any aliases? Our last dog--Atticus Hairyson Henson--was named after Atticus Finch (see the attorney and author part above) and my favorite Beatle (George Harrison), so we decided to stick with the literary and music theme. Her full name is Francis Lane Henson, Francie for short. Francie comes from A Tree Grows in Brooklyn, a favorite book of both mine and my husband's, and Lane from "Penny Lane." She gets the full thing when she's bad, and Francie-bug when she's adorable (which is most of the time). Does Francie do more to help or hinder your writing? Right now, hinder, but she's learning. She was a stray before we adopted her, so she's been desperate for attention. The more comfortable she gets with us, though, the more she trusts that we're not going anywhere and the more independent she's becoming. It's really great to see her transform and become more confident! 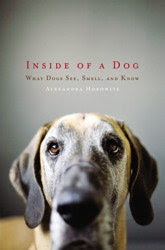 Has Francie inspired the creation of any dogs in your fiction? Not yet, but I have some ideas brewing. Cat, rabbit, squirrel, bird, chipmunk, you name it. If it darts, Francie is on it! We're trying to find ways to channel her prey drive before she drives our two cats insane. She's a sucker for a squeaker, but she really loves her Frisbee. She hasn't quite figured out the catching part, but the chase is half the fun for Francie. Who is Francie's best pet-pal? She'd love it to be the cats, but seeing as how they want nothing to do with her, Francie's best friend is my husband. She knows the moment his car pulls in the drive and wags her tail so hard her entire body waggles. What is Francie's best quality? Francie is extraordinarily good-natured. She loves everyone she meets and is the most complacent dog ever. We can play with her paws, cover her eyes with her ears, or hold her like a shepherd carrying a sheep and she just goes along with it. If Francie could change one thing about Alabamians, what would it be? She'd want more restaurants with outdoor seating. Francie loves going out with us (anywhere, everywhere), but we may be getting a little tired of the same two or three restaurants that allow dogs on their patio. If Francie could answer only one question in English, what would you ask her? Do you think you're actually a cat? Francie tends to lay on the back of the couch, and drape across our backs, and try to squeeze her body other places cats go that dogs don't fit, so I'm not sure if she understands that she's a canine at all. If Hollywood made a movie about your life in which Francie could speak, who should voice her? Chloe Moretz. Francie is young, and kind of sassy. I can totally hear Chloe as her voice. What advice would Francie give if asked? If all else fails, roll on your back and show your tummy. Humans can't resist a good tummy. My Book, The Movie: Devils Within. That’s me, Peter Zheutlin, lapsed (failed lawyer) and now writer, with Jamba, the third of our three rescue dogs from Louisiana. She a girl, about three years old we believe, and though her rescuers said she’s a Lab mix, truly, without DNA testing, it’s anyone’s guess. The way she always has her nose to the ground we suspect she’s part hound, like about 99% hound. I do almost all of my writing at Starbucks where I rent a table for about $5 a day. With three dogs at home it’s practically impossible to get work done there. 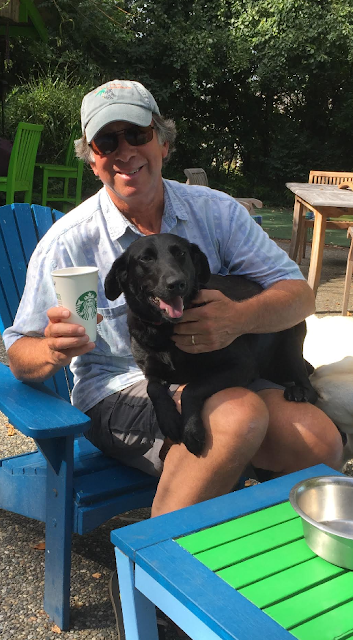 Now, I’d like to say this was take your dog to work day at Starbucks, but it wasn’t, so I brought my coffee home so Jamba and I could work on your questions together on the deck. Oh, and it’s always a decaf mocha latte with whip cream for me and water for her with a few liver treats. How were you and Jamba united? Funny you should ask. We were actually helping our older son, who had recently graduated from business school, find a rescue dog. To his credit, he quickly realized that Jamba was too energetic to be home in his apartment while he worked so she moved in with us and our other two rescue dogs, Albie (an alumnus of Coffee with a Canine) and Salina. 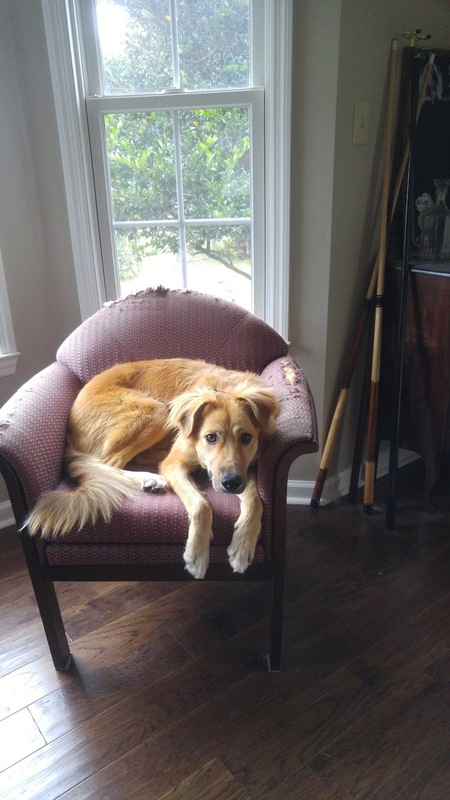 Our rescue contact in Louisiana for Jamba was Keri Toth, the same person who helped us adopt Albie. Our son went to Tulane University in New Orleans as an undergrad. And Jamba comes from Louisiana. So he named her after one of Louisiana’s most famous dishes, jambalaya. That’s her full name, Jambalaya, or Jamba for short. Of course our younger son started calling her “Juice,” as in Jamba Juice, so that also stuck. Does Jamba do more to help or hinder your writing? Both. She helps in that she provides a lot of good material. She’s a free spirit and a funny dog with a lot of zest for life. But she could play fetch with a tennis ball twenty-four hours a day and can be pretty insistent about it. It’s hard to say no. 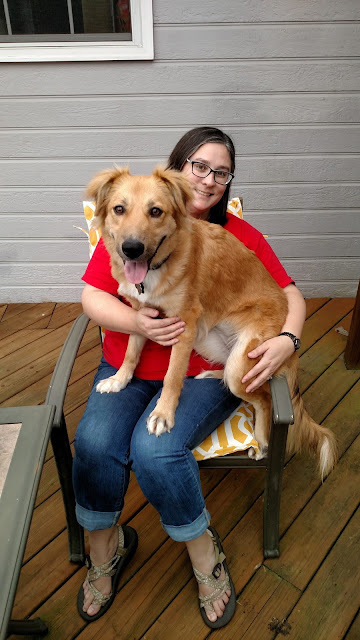 Please tell us about your new book, Rescued: What Second Chance Dogs Teach Us About Living With Purpose, Loving With Abandon, and Finding Joy in the Little Things. Rescued picks up the rescue story where my last book, Rescue Road, left off. Rescue Road took readers deep into the world of dog rescue, how it’s done and the remarkable people who do the really difficult work of saving dogs from terrible fates. That book ended with dogs being delivered into the arms of their new families. 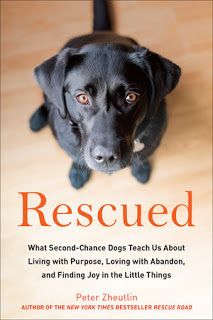 Rescued is about living with these second-chance dogs and the life lessons they teach us. Albie and Salina are obsessed with critters. They’ll stare at a tree for hours after spotting a squirrel there. Jamba could care less. It’s all about the tennis ball. Albie and Salina also go nuts when the FedEx or UPS guy comes to the house. Jamba just barks to be part of the group. She has no idea why she’s barking except that the others are. See above. She loves tennis balls more than Rafael Nadal. Her dream job would be to be a ball girl at the U.S. Open tennis championships. Who is Jamba's best pet-pal? ”defend the bed” in which they fight for control of our bed. What is Jamba's best quality? Innocence. In the fall when the leaves start to fall she will spend hours in the back yard chasing falling leaves. She looks like a child in a snow globe staring in wonder at what’s falling from the sky. I refer to her as the happiest camper in camp. If Jamba could change one thing about you, what would it be? She thinks I’m perfect. It’s another of her admirable qualities. Please don’t ruin her fantasy. If Jamba could answer only one question in English, what would you ask her? Can we take a break from throwing the ball now? If Hollywood made a movie about your life in which Jamba could speak, who should voice her? Easy. Tina Fey. If Jamba could talk I think she’d be hilarious. What advice would Jamba give if asked? Get a ball, be happy that you have that ball, and forget the rest. Everything is just nonsense. 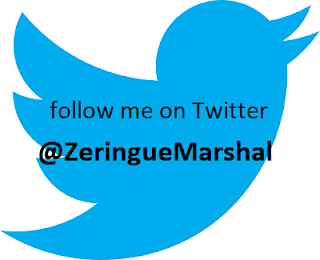 Visit Peter Zheutlin's website, Facebook page, and Twitter perch. Coffee with a Canine: Peter Zheutlin & Albie.